Just because the Miitomo party has to end, it doesn’t mean you can’t end it with a bang. 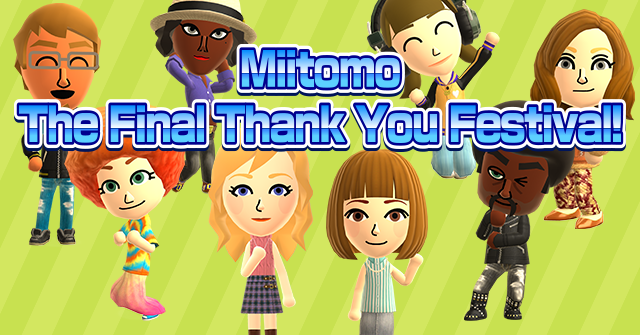 Miitomo Final Thank You Festival! Miitomo will no longer be available as of 5/9/2018. As a big thank you to everyone who has enjoyed playing Miitomo, we’ve prepared some special events so you can continue having fun until the very end! Note: For details regarding the end of service, please visit the official Miitomo website. #1: Daily Login Bonus – receive items until the last day! Users can log in to Miitomo to receive daily bonuses until the very end! Now is your chance to collect the items you’ve been eyeing and make an amazing Miifoto memory! Note: Miitomo coins can no longer be purchased. #2: The Final Miifoto Event – tweet your Miitomo memories! Head to Twitter and share a fun Miitomo memory by tweeting your favorite Miifoto! This is the last Miifoto event for Miitomo, so don’t miss your chance to participate! #3: Answers All About Miitomo – share your Miitomo memories with everyone! Until the end of service, all questions in Answer Central, as well as the question of the day, will be about Miitomo memories. Try sharing some of your own! Thank you to all our dedicated users for contributing to Miitomo. There’s only a short time left to enjoy playing Miitomo, so please make the most of it by participating in these events!